U.S. 191 is a transcontinental route, from the Mexican International Border near Douglas, Arizona, to the Canadian International Border north of Malta, Montana. This is the newest border-to-border U.S. Route, based on a 1997 AASHTO decision to extend U.S. 191 from Malta north to the Canadian Port of Entry. U.S. 191 follows State Control Route P-17 from Utah to East Flaming Gorge Junction, Interstate 80 from East Flaming Gorge Junction to Rock Springs/Elk Street exit, State Control Route P-13 from Rock Springs to U.S. 26-89 (Hoback Junction), and State Control Route P-10 from Hoback Junction to Yellowstone National Park. The only auxiliary (business, alternate, bypass, or spur) route for U.S. 191 in Wyoming is Elk Street between downtown Rock Springs (Junction Business Loop Interstate 80 and Business U.S. 30) and Interstate 80 Exit 104 (U.S. 191 Exit). This unsigned spur route is the original routing of U.S. 187 through Rock Springs. A new business route could be established along Elk Street and the Blairtown Connector southwest of Rock Springs. In 1926, U.S. 191 did not exist in Wyoming with the exception of the six-mile long Gallatin River section. U.S. 191 ran from U.S. 91 in Idaho Falls, Idaho, north to U.S. 2 at Malta, Montana. This routing was expanded in 1938, when old Idaho 36 and Utah 41 (between Tremonton, Utah, and Downey, Idaho) was recommissioned as a southern extension of U.S. 191. U.S. 91 and 191 were merged between Downey and Idaho Falls via Pocatello. In the 1940s, U.S. 20 was extended into Idaho and Oregon; its route from Idaho Falls to West Yellowstone was cosigned with the original U.S. 191. U.S. 191 remained along this routing until the completion of Interstate 15 in northern Utah and southern Idaho in the mid-1970s. Then U.S. 191 was decommissioned between Tremonton and Idaho Falls. U.S. 91 still survives today (in a severely reduced form) in Utah and Idaho because the interstate was routed over U.S. 191 rather than U.S. 91 between Tremonton and Downey. In the late 1960s and early 1970s, Utah and Wyoming hatched a plan to have a single-numbered highway route from Moab north to Yellowstone National Park. According to a Salt Lake Tribune article ("Utah, Wyoming agree on renumbering road to Yellowstone," courtesy of Dan Stober) dated October 4, 1970, Utah and Wyoming had agreed to use U.S. 163 as a continuous route to Yellowstone from Moab to Price and Vernal to Flaming Gorge. It continues, "Then Wyoming will pick it and number the roads from Flaming Gorge through Green River and Big Piney to Yellowstone as Wyoming 163." During this time, U.S. 160, from Crescent Junction, Utah, southward had been renumbered to U.S. 163 at some time in the twelve months prior to this story in the paper. Ultimately, that section was again renumbered, this time to U.S. 191, and was later extended to cover the route proposed in that newspaper story. I don't know if the reference to "Wyoming 163" is journalistic sloppiness or if they indeed intended to change from U.S. to Wyoming trailblazers at the state line. Also, another coincidence: when US 163 was truncated to Bluff, UDOT extended it eastward using a Utah 163 designation. So maybe there has been more than one attempt to use a U.S. 163/State-163 combination (as noted in the Tribune article above). Fortunes for the U.S. 191 designation changed for the better in 1982. In that year, the duplicated section of U.S. 20-191 between Idaho Falls, Idaho, and West Yellowstone, Montana, was partially decommissioned: U.S. 191 signs were taken down by the end of the year. With the U.S. 191 routing at that time ending in West Yellowstone, Montana, AASHTO recommended that the states of Wyoming, Utah, and Arizona use it as a new route to serve towns that do not have a common north-south U.S. route link. This was a very smart move for Wyoming and the other mountain states: this common corridor links the intermountain west and promotes tourism. 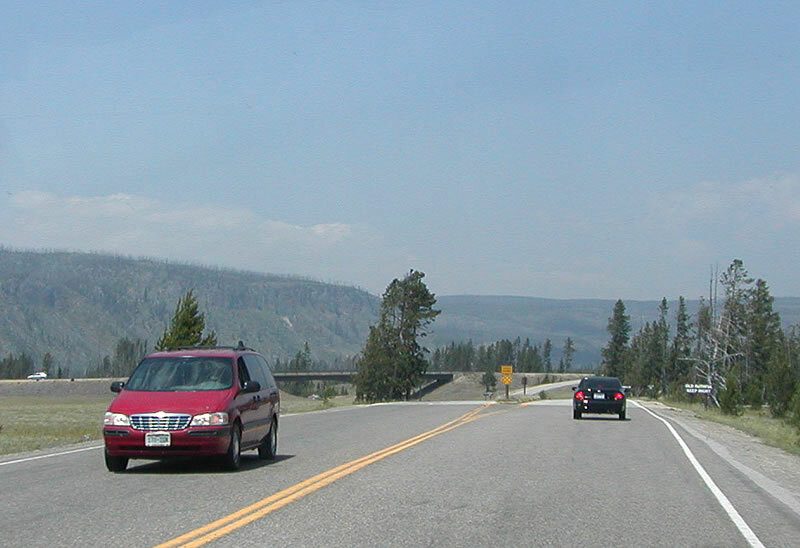 AASHTO recommended the following route for U.S. 191 in 1982: It would begin at the South Entrance to Yellowstone National Park. It would follow U.S. 89 concurrently to Moran Junction, then replace U.S. 187 between Moran Junction and Rock Springs. South of Rock Springs, U.S. 191 replaced old Wyoming 373 (Blairtown Connector Road and East Flaming Gorge Road), Utah 260 (Dutch John Road), and Utah 44 (Vernal Road). This routing is very similar to the U.S. 163 proposal discussed in the 1970 Salt Lake Tribune article, with one key difference: U.S. 191 would replace U.S. 187, while the U.S. 163 proposal would have replaced U.S. 189. The article specifically mentions that U.S. 163 would have entered Big Piney, which lies along U.S. 189 in west central Wyoming. At Vernal, U.S. 191 parallels U.S. 40 to the southwest, then cuts south toward Price and Green River, Utah, via a concurrently marked U.S. 6. At Green River, U.S. 191 merges with Interstate 70, then replaces the old U.S. 163 routing from Crescent Junction south to Bluff via Moab and Monticello. Today, a remnant of U.S. 163 remains in the Navajo Indian Reservation in southeastern Utah and northeastern Arizona. Continuing south along a new routing, U.S. 191 skirts the eastern side of the Navajo Reservation, coming to a temporary end at Interstate 40 in Chambers. During this time, U.S. 191 went through Rock Springs via the Blairtown Connector Road (Sweetwater County Route 51) and Elk Street, but this designation was removed, as the Wyoming Highway Department preferred travelers to enter Rock Springs via the Interstate 80 Business Loop (Dewar Drive). In 1995, U.S. 191 was extended yet again. This time, U.S. 191 replaced U.S. 666 between Chambers and Douglas, Arizona. This marked the first time U.S. 191 touched an international border. The U.S. 666 designation has been besieged with controversy, mostly because its moniker is considered a sign of the devil (hence the name "Devil's Highway" for U.S. 666). A USA Today article on the nation's most dangerous highways in 1992 listed U.S. 666 as a dangerous road, not only for its driving conditions but also because of the controversy over its number. I wonder if AASHTO used this popular perception of the "evil" of triple-six or if it was the because 191 should continue south for continuity purposes. I'd bet on the latter. Just when you thought U.S. 191 could go no further, AASHTO recently decided to extend U.S. 191 north from its old terminus at U.S. 2 in Malta, Montana, to the Canadian Border (see AASHTO Newsletter, 4/25/97). The 1999 Rand McNally Road Atlas was the first to reflect the extension of U.S. 191. To recap the whole U.S. 191 saga, it now begins at the Canadian border and heads south toward Yellowstone National Park. 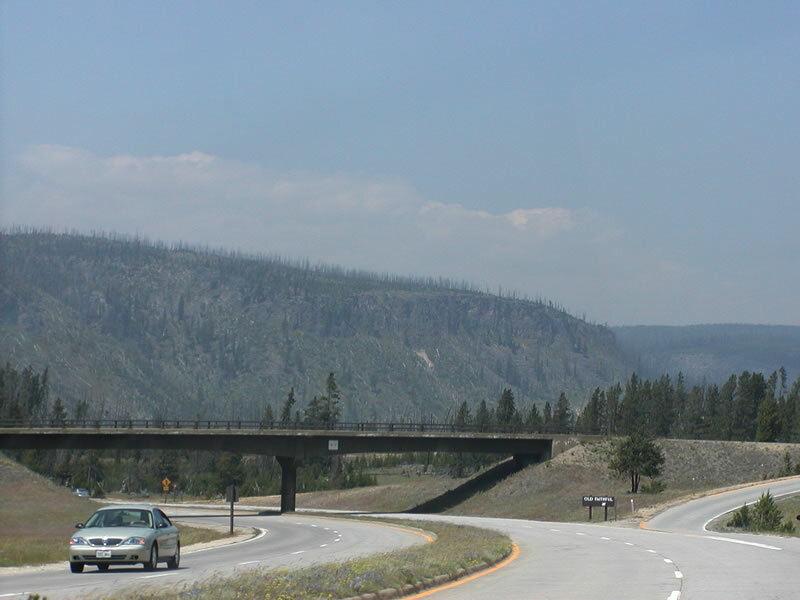 U.S. 191 followed U.S. 20 southwest out of Yellowstone, then ran concurrent with and parallel to U.S. 91 along the current alignment of Interstate 15. As the Interstate was completed, 191 became redundant along that path (especially considering that it was duplexed with U.S. 20 northeast of Idaho Falls). In its new incarnation south of Yellowstone, it was routed through Wyoming along the route of former U.S. 187, and ultimately south into Utah over formerly state-numbered routes. The route south of Interstate 70 in Utah, through Moab, has had many U.S. designations over the years. It was originally U.S. 450, then by 1938 it was U.S. 160, then still later it was U.S. 163. The redesignation as U.S. 191 came when a new road was constructed south from U.S. 163 into Arizona, then connecting with former Arizona 63 south to Interstate 40. With U.S. 191 extended to that point, which nearly lines up exactly with former U.S. 666 coming up from the south, it made perfect sense to redesignate that portion of U.S. 666 as U.S. 191. On top of all of this, on July 1, 2003, U.S. 666 in New Mexico, Colorado, and Utah was renumbered as U.S. 491. Seen as a spur of U.S. 191 (they meet in Monticello, Utah), this redesignation makes sense from the perspective of the numbering guidelines of the federal system. U.S. 666 was eliminated due to sign theft and a perception that "triple six is evil." A safety upgrade of the corridor was underway at the time the designation was changed. Beginning at Minnie's Gap (elevation approximately 6,300 feet), U.S. 191 climbs steadily from the Utah State Line as it heads toward Rock Springs. At the Green River - Red Creek Divide, U.S. 191 tops out at over 8,200 feet. At the base of this decline is one of the few runaway truck ramps to be found in southwestern Wyoming. All along this portion of U.S. 191, there are magnificent vistas of the Flaming Gorge National Recreation Area, Lake Flaming Gorge itself, and the Bitter Creek and Red Creek drainage basins to the east. Look for the Red Creek Badlands turn out for some gorgeous scenery. Horses range through this area occasionally. Firehole Canyon is along this stretch of highway; it is worth the ten mile detour to check it out. U.S. 191 is 65 m.p.h. for its entire rural stretch. The Sweetwater County sheriff patrols U.S. 191, while the Wyoming State Highway Patrol handles Interstate 80. There is so much traffic on Interstate 80 that the highway patrol agreed to work the Interstate 80 corridor, while the sheriff would handle all the primary and secondary arterials. The mileposts on this stretch of U.S. 191 begin at Interstate 80 #500 and work their way up to around #551 at the state line. In the winter, snowplows only go as far south as Maxon Ranch (Milepost #520), and they only go that far to allow for school pickup from outlying ranches. Of course, U.S. 191 does not actually have 551 miles in the state. North of Rock Springs, the mileposts reset at zero and work their way north to Pinedale. This is due to the fact that U.S. 191 is located on two different state control routes. After descending into the Bitter Creek Basin, U.S. 191 quickly meets the interstate. Just before the intersection Sweetwater County Route 51. This acts as a "back way" into Rock Springs via the Blairtown Connector. To get to downtown, take this road. To get on Interstate 80, stay on U.S. 191 north. There is a token Conoco station, which is notable because the body of a murder victim was found at this truck stop several years ago. U.S. 191, now merged with Interstate 80 and U.S. 30, spends five miles on this, its only freeway alignment in the entire state of Wyoming. The Dewar Drive business loop provides access to the typical interstate hotels. U.S. 191 quickly ascends an incline as it gets out of town, leaving behind the hotels and gas stations that litter the route along Interstate 80. This incline, called 14-Mile Hill, takes travelers up the White Mountain, which looms over the northwest side of Rock Springs. At the top, look for Pilot Butte: It will be the large, square-topped butte in the distance. If you have the proper vehicle, take a drive to the butte via the county roads; the top of the butte affords an incredible vista of the surronding desert. Continuing north on U.S. 191 (Old U.S. 187), you will not see any major civilization for fourty miles. Much of the land is arid, flat rangeland, dominated by sagebrush. Near Eden and Farson, however, the land is highly irrigated in the hopes of developing a agricultural economy. This has met with limited success, due both to the harsh climate and the alkaline soil. At the Wyoming 28 stop sign in downtown Farson, look for the ice cream shop. This is a popular respite for the travelers taking the Rock Springs to Jackson trip. Some are anglers, others are hunters, still others are vacationers. Many stop at Farson since it's kind of a midpoint between Rock Springs and the next town of significance, Pinedale. Looking east from Farson is the South Pass via Wyoming 28, the Killpecker Sand Dunes, and Boar's Tusk. South Pass is the fabled gold mining operation located along the Oregon Trail (see the Wyo. 28 guide for more). Well off the road, the sand dunes (operated by the BLM) are a popular place for off-road travel. In the same area is Boar's Tusk, an unusual volcanic formation in the middle of the desert. It is of the same geologic type of extinct volcano as Devil's Tower. Both Killpecker Sand Dunes and Boar's Tusk are accessible via Sweetawater County routes. 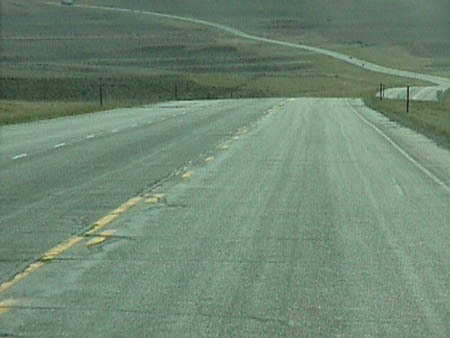 U.S. 191 enters Sublette County as it passes the Big Sandy Reservoir. The view of the Wind River Mountains, distant at the 14-Mile Hill, come clearly into focus. Pinedale, the county seat, lies at the base of these mountains, at an elevation 7,175 feet. This is a typical cattle town, with log buildings and false front structures. Look for the turn off to the Green River Lakes via Wyoming 352. If you have time to visit this area, it is well-worth the trip. Turning due west, U.S. 191 meets up with U.S. 189 at Daniel Junction. 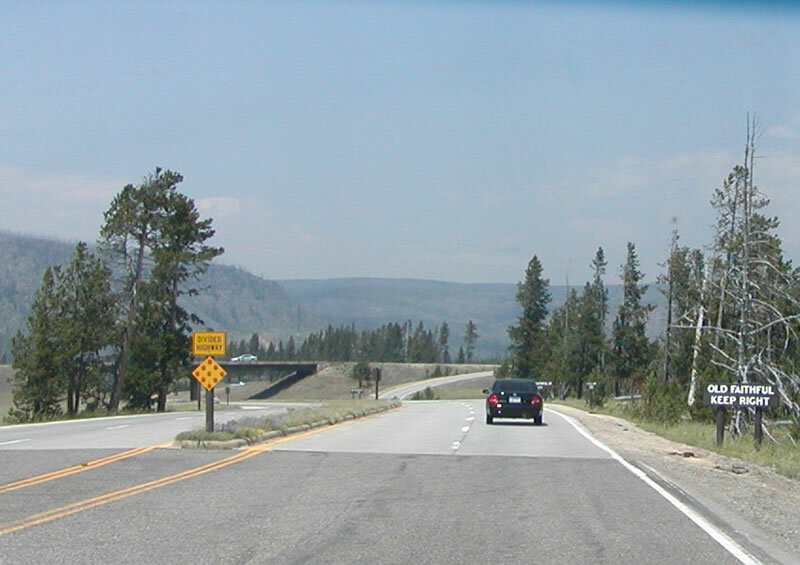 The two routes continue, merged, north into the Bridger-Teton National Forest as a scenic byway. Be sure to stop at Hoback Rim, at 7,921 feet. This vista makes the trip from Rock Springs worthwhile. Finally the terrain has changed: there are far more trees, wildlife, and mountains. This is nothing like the desert and sagebrush U.S. 191 left behind. U.S. 189-191 continue northwest toward Hoback Junction, crossing the Hoback River several times. The picturesque community of Bondurant is located in the valley beneath the Hoback Rim, and there are signs providing directions to nearby hot springs. At the Hoback Junction, U.S. 189-191 merge with U.S. 26-89, which brings travelers from places as diverse as Alpine, Star Valley, and Idaho Springs. U.S. 26-89-189-191 travels due north into Jackson, meeting Wyoming 22 just south of town. 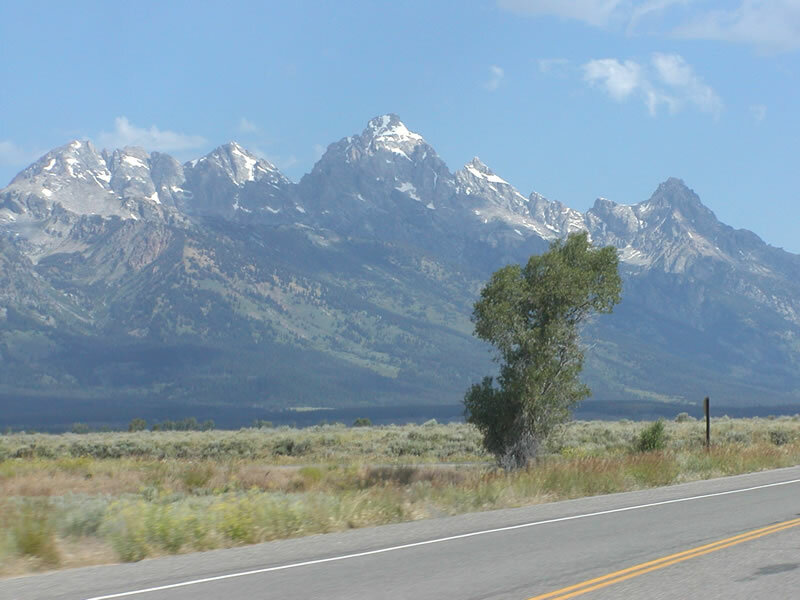 This route travels west to serve Teton Village, the Teton Pass, and Grand Targhee. Skiers will become familar with Wyoming 22 rather quickly. Jackson is a community of contrasts: look at its unbridled commercialization to the south try to mesh with the old West image of its downtown square. Even the downtown square is home to several outlet shops, including the Gap and Benneton. There is a bar located between these kinds of shops that has saddles rather than bar stools. So the commercialization that has taken hold at many ski areas nationally has taken a seat next to Jackson's Old West image. This uneasy alliance between old and new has been an issue for years; Jackson area residents are trying to prevent further growth in the area through building moratoriums and tough zoning laws. Despite all this, the scenery around the town is incredible. Snow King Ski Resort's Storm Mountain towers above Jackson, allowing skiers to ski right into town from the top of the mountain. Sleeping Indian Mountain, to the northeast of Jackson, gained notoriety recently when a Secret Service airplane crashed into it, killing all abroad. The jet was part of President Clinton's entourage that visited Jackson that year. 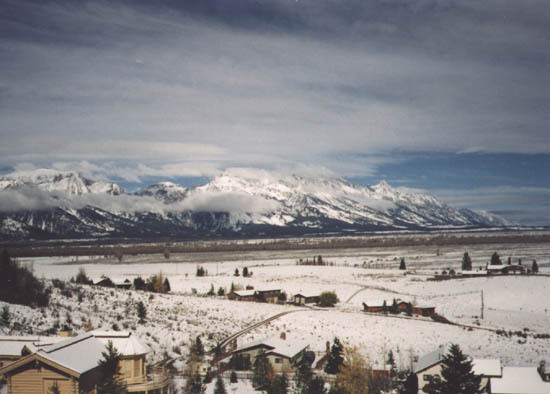 With the mountains on the west, the town is enclosed on three sides, hence the nickname "Jackson Hole" for the area. In the midst of these contrasts (Old West, Commercialization, Scenery), U.S. 189 ceases its journey northward. About two blocks south of the Jackson town square, a sign marks its end. However, U.S. 191 (and U.S. 26-89) turn left onto Cache Street, and they continue north toward Grand Teton National Park. The Elk National Wildlife Refuge and the Flat Creek provide neat vistas just north of Jackson, especially of the elk wintering on the floor of the valley. You'll see the fences for the refuge come right up against the boundary of the town of Jackson. U.S. 191 (and U.S. 26-89) have several vista points for the elk. The weather in Jackson Hole is one of extremes: it is frequently among the colder spots in Wyoming. Jackson, Pinedale, and Laramie tend to share the coldest temperatures in the state. The city of Laramie, of course, is on a windswept plain (high-altitude desert), which explains its cold weather. Pinedale is at a similar elevation as Laramie (around 7200 feet) and receives wind from the mountains. But Jackson is at a lower elevation (closer to 6000 feet) and is surrounded by mountains. Even so, in the winter (and fall and spring), the temperature in Jackson stays below freezing. Snow and blowing snow is quite common. The Jackson Airport, just north of town and along the Elk Refuge before the national park entrance, has quite a bit of wind. Pilots need to take care flying into the airport due to the wind and reduced visibility due to the mountains all around the airport. This airport is one of four (the others are in Cheyenne, Casper, and Saratoga) in the state that has a runway long enough to support larger jets. Just before the Airport Junction, northbound U.S. 26-89-191 travelers are afforded the first view of the Grand Teton Range. At Moose Junction, the Wyoming Highway Department ceases maintenance of the highway. In fact, this is the last time you will see trailblazer signage for U.S. 191 northbound in Wyoming, with the exception of Moran Junction. The U.S. routes are poorly signed in Grand Teton National Park and Yellowstone National Park (in other words, there are no shields to be found). Moose Junction and Moran Junction are about the only place to find U.S. shields, and these shields were placed by the Park Service, not by the state. Continuing north, stop at Moose Junction and pick up a Grand Teton National Park brochure and map. Teton Park Road is a beautiful alternate route, although a fee payment is required. It serves Jenny Lake, campgrounds, and several hiking trailheads. The main U.S. 26-89-191 road reconnects with Teton Park Road about 20 miles north of Moose Junction. At Moose Junction, U.S. 26-89-191 meets U.S. 287. The warning signs for the intersection say "Moran Junction, one-half mile." At the stop sign, you will see signs telling you which routes go where. U.S. 89-191-287 go north to the South Entrance of Yellowstone Park, while U.S. 26 leaves U.S. 191 to head southeast with U.S. 287 toward Dubois and Lander. The U.S. 191 sign at this intersection is the only wide, rectangular-designed U.S. marker I've seen in the State of Wyoming. Standard issue for all U.S. route signs, two- or three-digit, is square. The lettering is reduced for three-digit routes rather than expand the shield. U.S. 89-191-287 are now part of the John D. Rockefeller Memorial Parkway. The fee collection booth sits just north of Moran Junction, and Jackson Lake comes into view. This lake is natural, but its capacity increased in 1916 with the construction of the Jackson Dam. Today it is popular for boating, fishing, and waterskiing, but the water is cold! From here, U.S. 89-191-287 enter the world-famous Yellowstone National Park. For a guide to the Park's roads, go to The Grand Loop Road page. U.S. 191 is not designated through the park, but to continue on U.S. 191, take the southwest portion of the loop through the Old Faithful area, then turn left at West Thumb Road. Entering Montana, U.S. 191 regains its signing for the first time since Moran Junction, and it heads north right along the Montana-Wyoming border. 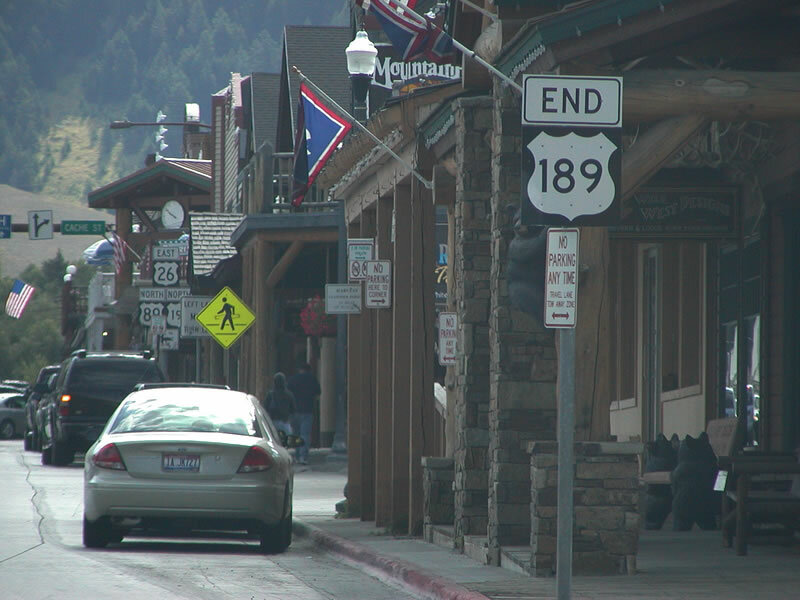 U.S. 191 reenters Wyoming (and Yellowstone National Park) briefly through the "Gallatin" segment. Most travelers would not know the highway is in Wyoming because there are no signs marking the state line. The Montana Highway Department maintains this stretch of Wyoming U.S. 191, since it is unconnected with the rest of Wyoming's road network. This six-mile stretch of U.S. 191 leaves the Grayling Creek drainage and meets the Gallatin River. U.S. 191 never strays more than a half-mile from the border, and it quickly reenters Montana en route to Gallatin Canyon, Big Timber, Malta, and Canada. There are several three-lane segments along northbound U.S. 191 to allow for passing. The middle lane acts as a "suicide lane" because it can be used by both directions of traffic, even though preference is given to uphill traffic. Photo taken by Mike Ballard, 8/98. Northbound U.S. 191 approaches Wyoming 28 in Farson. Photo taken by Mike Ballard, 8/98. In the small town of Faron north of Rock Springs, U.S. 191 meets Wyoming 28. Use Wyoming 28 east to South Pass and Atlantic City. Photo taken by Mike Ballard, 8/98. 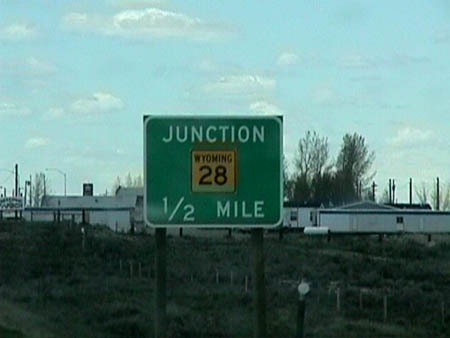 Southwest of Jackson, eastbound U.S. 26 and northbound U.S. 89-189-191 (Broadway Street) meet Wyoming 22 (Teton Pass Road) at the "Y" intersection. Wyoming 22 travels west to Wilson and Wyoming 390, which connects to Teton Village. After that, the highway travels over Teton Pass (elevation 8,429 feet) into Idaho, where it becomes Idaho 33. U.S. 26-89-189-191 continue straight ahead into Jackson. Photo taken by Casey Cooper, 07/09/05. Here is another view of the same intersection (eastbound U.S. 26 and Northbound U.S. 89-189-191 at Wyoming 22) in Jackson. This picture clearly shows that U.S. 189 continues north as far as Wyoming 22; it ends in downtown Jackson a few miles north of this point. Photo taken by Greg Coniglio, 1998. Now entering downtown Jackson, U.S. 189 ends, having reached its northern terminus. Eastbound U.S. 26 and northbound U.S. 89-191 turn left (north) to continue toward Grand Teton National Park and Yellowstone National Park. Prior to entering Yellowstone, U.S. 26 will turn southeast at Moran Junction to cross Togwotee Pass (elevation 9,544 feet) along with U.S. 287 to serve Dubois, Crowheart, and Riverton/Lander in Fremont County. Photo taken by Casey Cooper, 07/09/05. 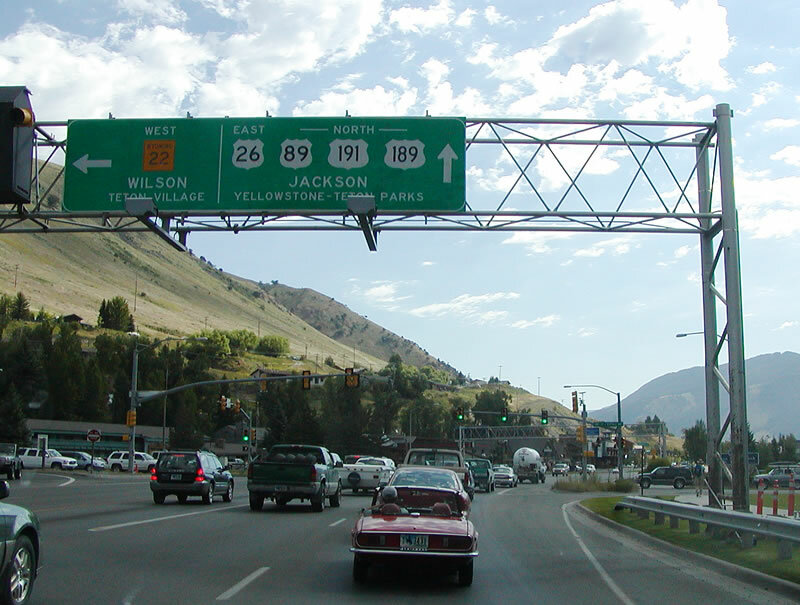 U.S. 189 ends in Jackson at the intersection of Broadway Street and Cache Street, not at Hoback Junction or at the Wyoming 22 as some maps seem to indicate. A relatively short U.S. route, it connects to its parent (U.S. 89) at either end, with a gap between Heber City, Utah, and the Wyoming-Utah State Line on Interstate 80. If the section of U.S. 189 is decommissioned in Utah, the orphaned stretch of U.S. 189 would be a single-state U.S. highway, residing solely in Wyoming. Photo taken by Casey Cooper, 07/09/05. Once U.S. 189 is traveling nearly due east toward Jackson via Broadway, three of the routes (U.S. 26-89-191) prepare to turn north on Cache Street to connect to the Elk National Wildlife Refuge and Grand Teton National Park. Just prior to this intersection, U.S. 189 ends as northbound U.S. 26-89-189-191 approaches the Cache Street intersection in downtown Jackson. Photo taken by Dale Sanderson, 8/98. The Grand Tetons rise to the west of U.S. 26, U.S. 89, and U.S. 191 as the three routes travel north toward Moran Junction. Photo taken by Casey Cooper, 07/09/05. This view of the Grand Tetons is afforded along eastbound U.S. 26 and northbound U.S. 89-191 within Grand Teton National Park. Photo taken 11/94. 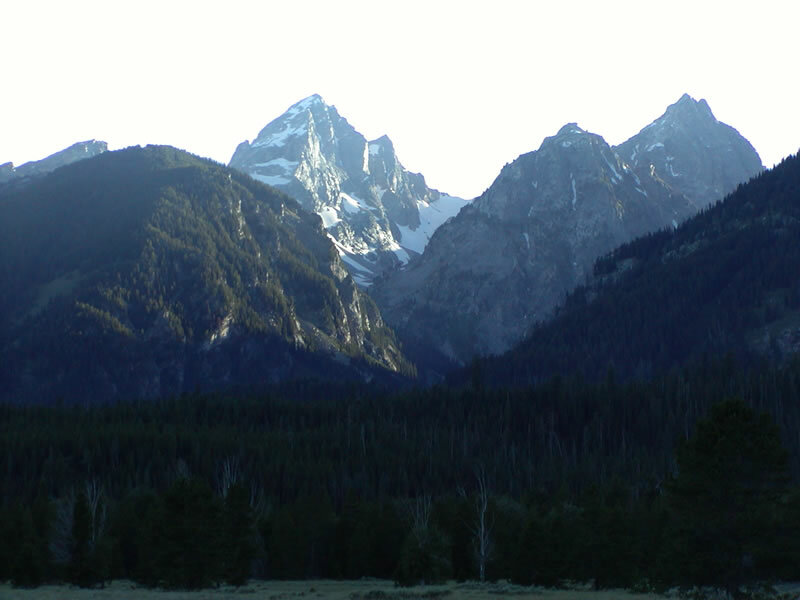 North of Moran Junction, this view shows the mountains at dusk in Grand Teton National Park. Photo taken by Casey Cooper, 07/09/05. 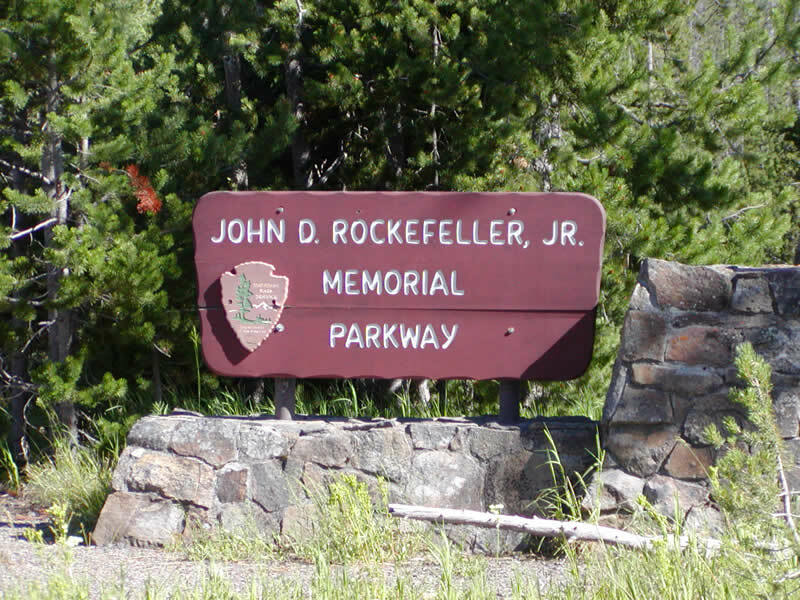 U.S. 89, U.S. 191 and U.S. 287 leave Grand Teton National Park and enter the John D. Rockefeller Memorial Parkway, a brief section of preserved land that separates Grand Teton from Yellowstone. There are no shields for any of the routes north of Moran Junction. Photo taken by Casey Cooper, 07/09/05. Now in Yellowstone National Park, northbound U.S. 89, U.S. 191 and U.S. 287 approach the turn off for the popular Old Faithful area, which includes the steadfast Old Faithful geyser and the Old Faithful Inn, which is routinely cited as one of the most beautiful lodges within the National Park System. Photo taken by Casey Cooper, 07/16/05. 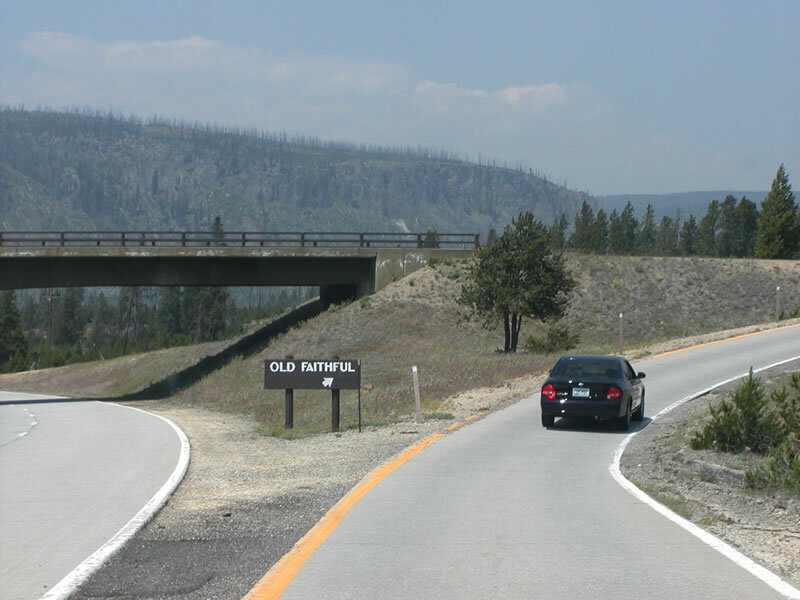 The two-lane U.S. 89, U.S. 191 and U.S. 287 changes into a four-lane freeway as the highway approaches the turn off for Old Faithful. The freeway ends just after the interchange, and U.S. 89-191-287 reverts to a two-lane highway. The exit is a high speed trumpet interchange. Photo taken by Casey Cooper, 07/16/05. Remnants of the massive 1988 fires that ravaged Yellowstone National Park are still visible today, especially on the treeless mountains and dead sticks that remain almost 20 years later. Old Faithful Inn survived the fires, but just barely. It was saved by the valiant efforts of firefighters in August 1988. The overpass makes part of the connection in the trumpet interchange. Photo taken by Casey Cooper, 07/16/05. Use the right lane to exit into Old Faithful. Continue in the left lane to follow northbound U.S. 89, U.S. 191 and U.S. 287 to Madison, where the routes divide. U.S. 191 and U.S. 287 turn west along with U.S. 20 to West Yellowstone, Montana, while U.S. 20 and U.S. 89 continue along the Grand Loop Road to Norris Geyser Basin. Photo taken by Casey Cooper, 07/16/05. 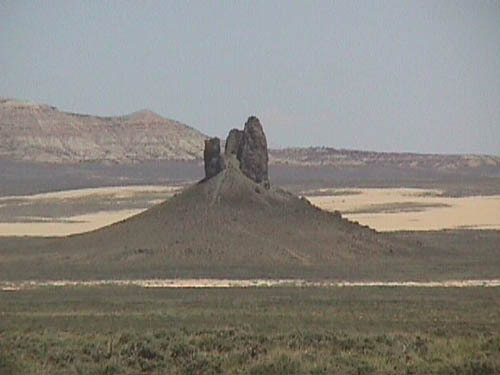 View of Boars Tusk along U.S. 191 north of Rock Springs. Photo taken by Mike Ballard, 8/98. Page Updated October 30, 2005.